My 4-year-old son and I got our haircuts simultaneously last weekend. He usually stays still during his haircut, but since we were both in a chair at the same time and I was rendered useless under the barber’s smock, my son decided to challenge the barber by constantly moving and bouncing all over the place. Not smart when you’ve got a moving blade on your head. “Please look straight ahead,” my barber instructed me. My son obeyed me, and I obeyed my barber. We both sat still while our respective barbers cut our hair. But it wasn’t long before my son started moving around again, excited that both he and his daddy were getting a haircut at the same time. I truly feared the barber would accidentally cut a groove into my son’s head if he moved too abruptly. I turned to my son and said, “Please don’t move -- Ahh!” My barber nicked me with the clippers as I tried to reprimand my son. I guess my barber wasn’t expecting me to move so suddenly. The barber said he did, in fact, almost cut off my ear when I unexpectedly turned. He said he also cut my hair a little too short in one spot on the side of my head. He asked if I wanted him to cut my hair one blade closer to my scalp to hide the accident. As my barber switched blades and began to take another layer of hair off my head, I noticed that my son was fidgeting around again and causing his barber a lot of frustration. My fears of his barber cutting him on accident began to brew in my brain. I didn’t let those fears brew too long before I twisted in my chair to scold my son for causing his barber such a hard time. And just as I was remembering the challenge I was creating for my barber, I felt another nick on the back of my head. “I have to take it down another layer,” he said. “I’ll be completely bald if you take it down another layer,” I responded. The look on my barber’s face indicated that I could either take a bald head or keep an ugly racing stripe down the back of my scalp. I opted for the bald head. My son’s barber was just finishing up his haircut when the boy decided he wanted to jump off the chair right then to grab a lollipop. Like electricity shooting through my body, where my legs and arms moved all on their own, I flung the smock off my body, hurled myself off my chair into the air to catch my boy in the act of leaving his chair, and tried to prevent his barber from hacking off my son’s ear . . .
And that’s the true story of how I became bald and lost my right ear. No kidding. See this is why I can't be a dad yet, I would have let the barber jack up my sons hair and when he cried about it, (and I sat there with a perfect haircut) I would tell my son he better listen to me next time. 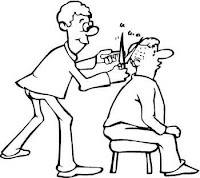 Besides I've never heard of a Barber accidentally cutting off a whole ear, maybe a nick here or there but he'd be fine.